I started working more on the "Color Cave" this weekend. First thing I did was paint the shelves. That is going to take a while to finish that project. I live in Florida and it's summer. During the summer in Florida it rains nearly every day at 3 - 4pm. 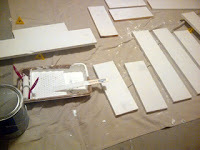 The humidity is so bad that it takes a long time for the paint to dry between coats. I did buy some items in hopes that they would make the painting time better. They are little painters pyramids. You paint both sides of the boards and they hold them off the ground so they can dry underneath too. 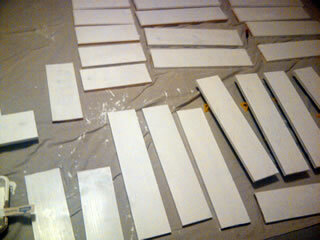 I didn't have enough for all my boards, so a lot of the boards only got painted on one side today. I'm hoping the rest of this weekend will be milder outside and I can paint the rest. I need to keep up the painting because the sap from the boards was starting to flow again...didn't know it would do that, so I'm hoping to get them all painted soon to stop that and continue putting my room together. All my collection is still boxed up until I do. Until then though I am still prepping my collection for display once I can get the display finished. All of my dolls are loose, not boxed, etcetera. So I risk exposure to dust. Any collector knows you really want to keep dust away as much as possible so I hatched a plan. Display boxes! Okay, so before you say "Hey, you can just buy clear cases to put your dolls in. Why 'make' one?" I know they make clear acrylic doll display cases. These cases cost a lot of money. Especially if you want to use them for multiple dolls. you can buy a 9.5" x 5" x 13" to 9.5" x 5" x 19" case from $10 - $14 each. There are several different styles and thicknesses for many different prices. You would need to get those for each doll, which is over 13 if you get one for every color kid and dress-up doll. If that were the case it would be $130 - $182. You can even get "multi doll" displays that cost hundreds. You can get large curio cabinets with mirrors and glass that can cost hundreds or even thousands. Some collectors have dolls in boxes already, so I thought it would be neat to make doll boxes in the style of the old/classic/original boxes for my collection. That way if put next to an original box it would be the same size and still protect the doll from dust. All this and I think I can make all my boxes by hand and the cost be under $10 a box. Anyway, the box is a "Trapezoid" shape when together. 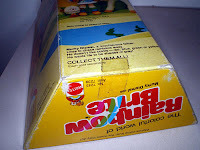 All the small dolls that were in boxes were in these same boxes. 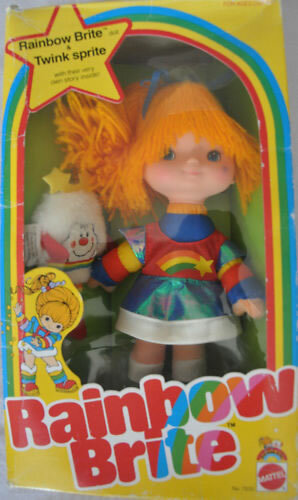 That's Rainbow Brite, the Color Kids, Murky Dismal and the Dress Up Dolls. I did a lot of trial and error over the last few years with this theory. I have been to many hobby stores searching for materials as close to the original doll box as possible. None of the hobby stores really had the right paper. I tried the Office Supply stores too, and they didn't have much either. I ordered board samples from companies, but the boards were too thick. Very much a "Goldilocks & the three bears" situation. "This is too big" or "Too Small" finally I found some that were nearly "Just right". 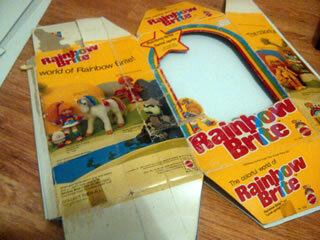 I will give the details to the "Box" construction in the next blog entry, once I have everything I need. In the mean time I am still recording the Brite Cast episodes! We are currently up to Episode 4! Yay! And, we have a special "Mini cast" coming soon, so keep an eye out for it! I hope to have more news for you soon, so until then!